After installing them , Gummi will work fine! 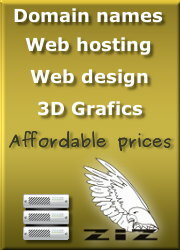 What about creating an airline company called “Geeko Air”? Is an awesome idea , isn’t it? So let’s see what it is. Before 10 days i had to travel from Madrid to Paris for my Practicum. At this case casual dress is a mandatory , so i wore a Geeko shirt (thanks Bruno :)). While passing the security control , the security guy (named Josue) saw the openSUSE badge (the front one) on my shirt and asked me ” Do you work for openSUSE?” my response was “No i contribute to the openSUSE Project”. The security control stopped and an interesting conversation begun. Josue told me that he was an Ubuntu user , but now uses openSUSE and he is very satisfied. Without any thought i gave him the only openSUSE Promo DVD i had. A few days after the openSUSE conference is over, it is the right moment to write my report. 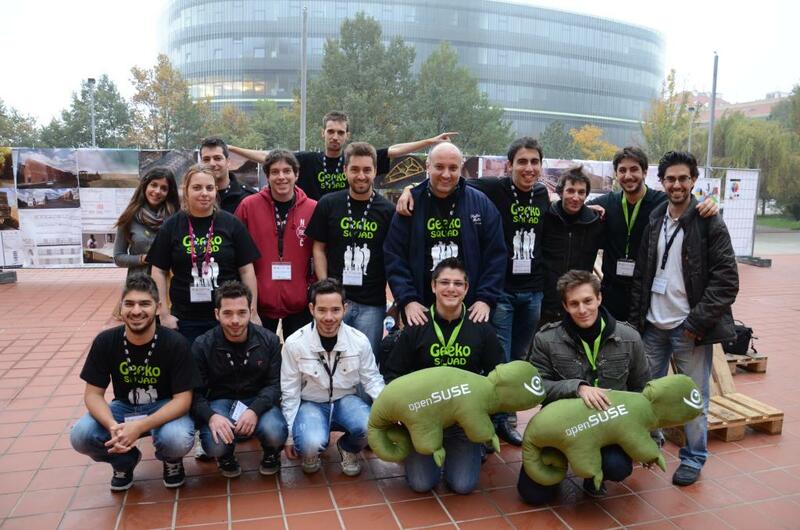 For me it was the first openSUSE Conference which i attended to. It was the first time that i was surrounded by hundred of Geekos during 4 days and interacted with people from the openSUSE Community , SUSE other distribution and other FOSS projects as well. People from openSUSE , Gentoo , Ubuntu , Fedora have been there to collaborate, make a presentation , discuss about FOSS and at the end of the day have a beer (pivo, in Czech). So what did i do during the oSC2012? First of all , at Day Zero, the whole Greek community went to the Venue so as to help with the setup up and explore the Venue as well. It is a truth that i I was amazed by the infrastructure, the coordination and the high level of education provided by the University. I had the opportunity to get into a laboratory and saw that the students do make their own experiments there. At the end of the day we drunk a couple of beers and personally discussed with the Spanish spoken guys. We had fun by expressing our ideas and interact with people who live far away from European continental . Actually the first day i helped at the registration desk by giving swag ,all the necessary staff and piece of information to the recently (or not) registered attendees. By the second day and until the end of the conference i worked at the Social Media team with Kostas Koudaras and Jos Poortvliet. Our goal was to spread to the social media (twitter,google+,facebook) the presentations,talks,workshops and what was going on during the conference. In that way people who attended to the conference were up-to-date for what is going on and people who didn’t attend had also the opportunity to enjoy the conference by watching the live streaming. Finally i did translate some of the tweets in Spanish , so the Spanish spoken people be up-to-date as well. Apart from attending at some presentations i did make my own. Actually my presentation was related to my failure in GSOC 2012 with openSUSE Project. I explained to the crowd [ok i admit i was a bit nervous , it was my first presentation in an international conference] who am i , which are my plans and encouraged people to participate at the next Google Summer of Code with openSUSE Project. Finally i mentioned that what a failure does mean and what doesn’t mean in that case. My presentation is available here. a) Met people from Latin America (Sebastian, Axel) and discuss with them about the community there. f) Joined the conference by another point of view : as a volunteer who worked on a group. According to some people, FOSS conferences are dominated by corporate representatives promoting their products.I disagree with that because in my point of view FOSS conference are dominated by participants , volunteers , FOSS communities and FOSS companies. The main point is the interaction between all of these parts . 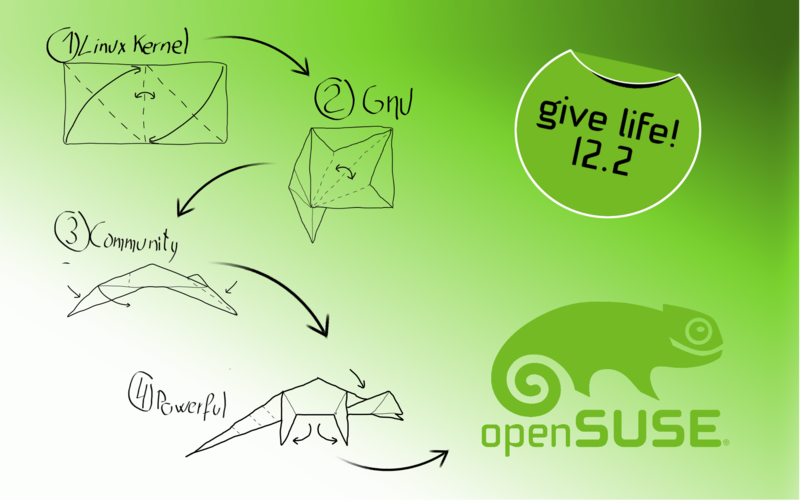 See you at the next openSUSE Conference! Despues de la fiesta de lanzamiento del openSUSE 12.2 que tuvo lugar en Madrid , el Martes que viene [06/11] tendrá lugar fiesta de lanzamiento en Barcelona! Mas información podéis encontrar aqui. 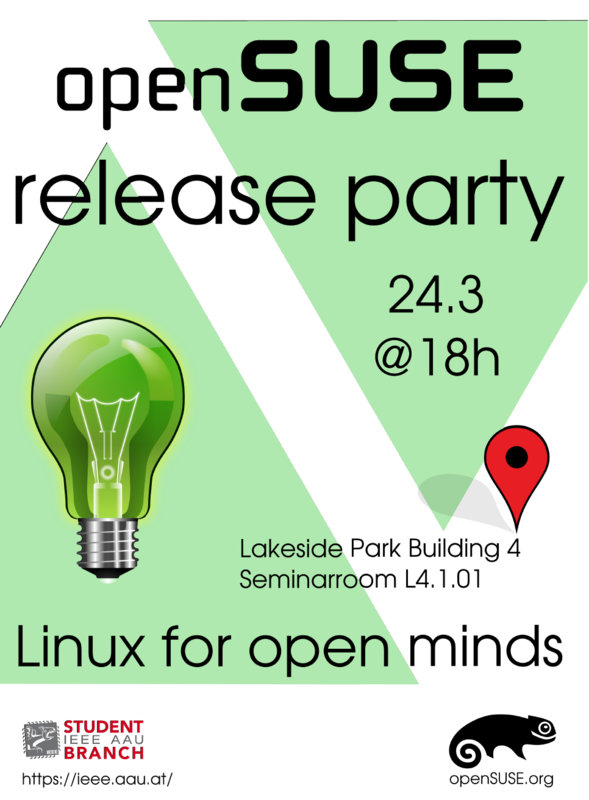 After the openSUSE 12.2 Release Party took place in Madrid , the next Tuesday [06/11] the openSUSE 12.2 Release Party will take place in Barcelona! More info can be found here.